DC have hit the reset button on their ongoing Superman series, bringing us back to number 1 with an all-new creative team and one heck of a plot twist. 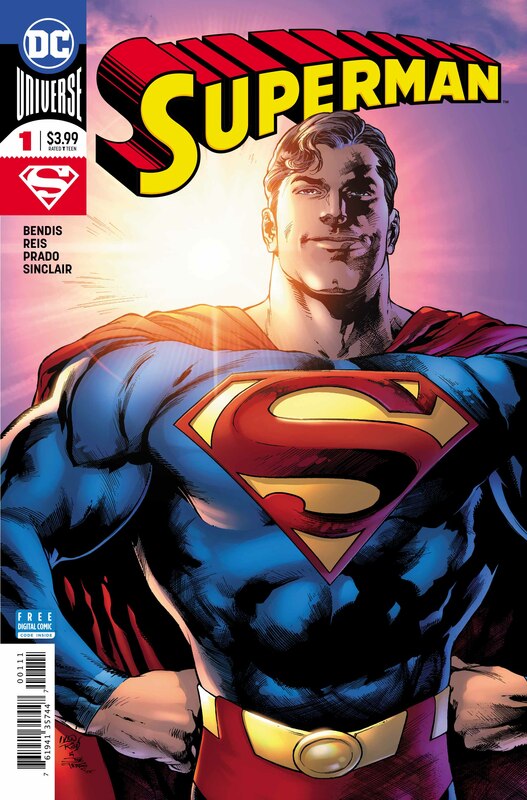 Hot off the events of the Man of Steel mini series, Brain Michael Bendis is back in the writing chair for the first issue of this new Superman run. Although this is a first issue, much of the story has hooks from the Man of Steel series and Bendis takes advantage of that by diving straight in to the next series of events. 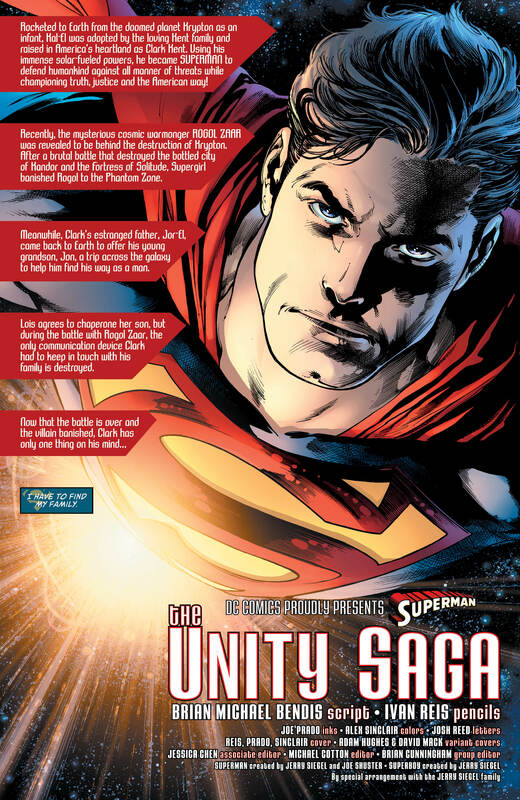 We know how strong and fast Clark is and this issue really helps place the emphasis on that particular aspect of the Man of Steel as, en route to finding Lois and Jon, he makes light work of an entire fleet of Dominators. While having a conversation with one of his Justice League compatriots, he darts backwards and forwards to various disasters around the world, never missing a beat in the process. 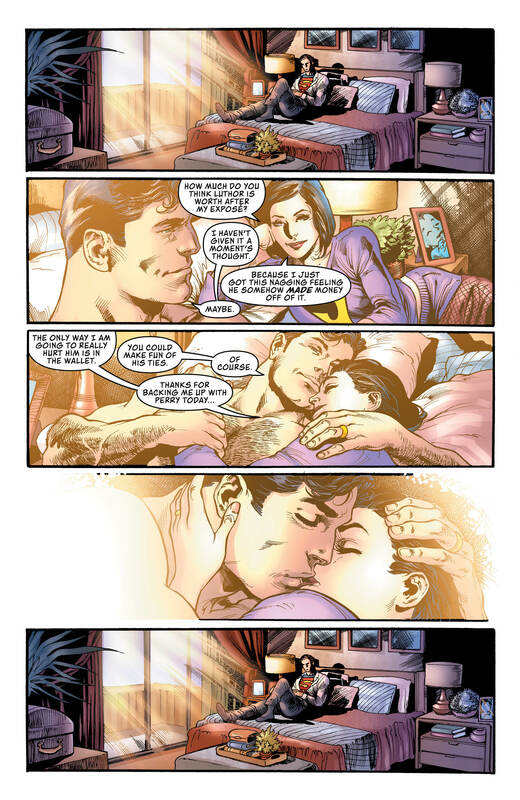 We also know just how strong Superman is, but this issue also focuses on Clark as a husband and father. It’s clear just how much being without his family wounds him and we are treated to several flashbacks of what life is like at the Kents. It is heartening to see an all-powerful godlike hero like Superman acting like the rest of us, being portrayed as a relatable person who cares for his family and simply wants them to be safe. 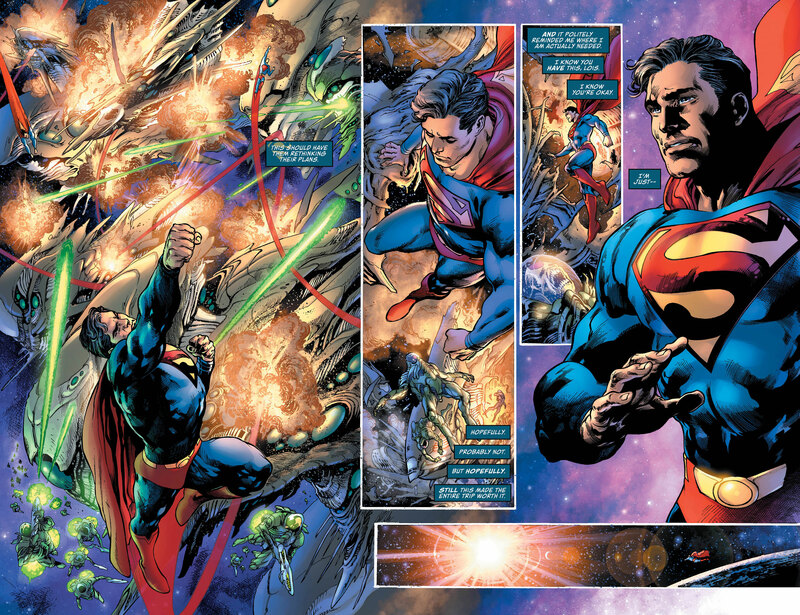 Ivan Reis is on pencils this month and he gives us some fantastic looking panels featuring quite a few iconic heroes from the Justice League. Reis has tapped into the established style from the previous creative team but added his own twist to the proceedings. The characters will be instantly recognisable to anyone carrying on from the previous arc, but there is something more exaggerated in the linework that gives everything a larger-than-life appearance. Joe Prado’s heavy ink lines certainly help to define Reis’s pencil work, emboldening the facial features of each of our characters and really adding to their expressions. 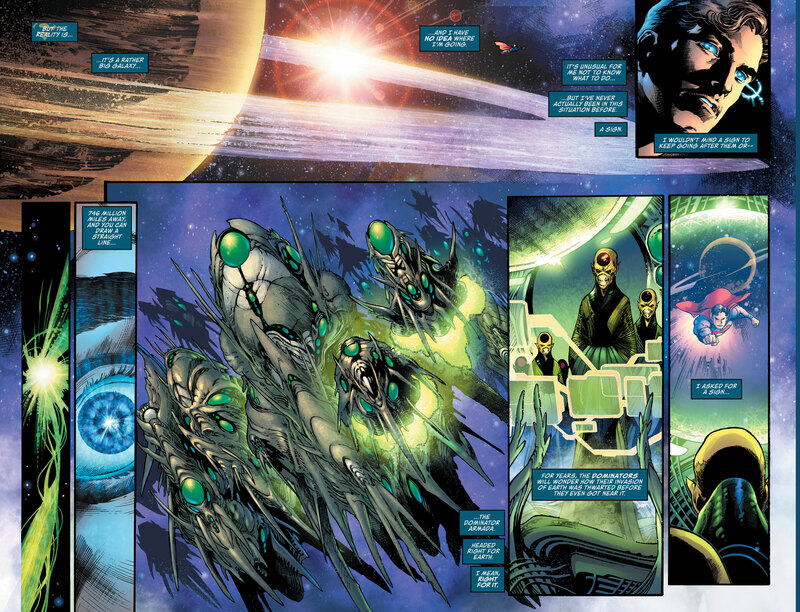 Alex Sinclair does some typically spectacular work with the colours this issue. Superman’s costume is as iconic as ever but it really pops off the page due to the dynamic colour range. When the other heroes turn up to lend a hand we are treated to some truly vivid and colourful special effects. whether that be the Scarlett Speedster’s golden lightning bolts or Hal’s dazzling green aura. The issues as a whole serves as a wonderful continuation of the Man of Steel storyline, and helps flesh out the events and the aftermath of Superman’s final battle with Rogol Zaar. Unfortunately, this is also the book’s greatest weakness, as many people will see “Superman issue one” and pick it up, expecting it to be the start of a brand new story. Sadly, DC have opted to begin the tale 6 issues prior to this reboot which in reality means this is actually issue 7. I can only imagine that a lot of readers are going to be either very confused or very annoyed when they realise there is a whole lot of back story they missed out on. Having said all of that I really enjoyed this issue and those of us who read the Man of Steel mini series will find a lot to like here. Bendis once again shows that he knows exactly what Superman is all about, and that he’s a lot more than just a super powered battering ram. We get to see what is important to Clark, we get to see him actually feel pain and we get to see him using his incredible power without giving in to it. In this issue it really is easy to feel that, despite being the most powerful, the most alien and the most respected of the DC heroes he is also just a man protecting what is important to him, his family. The final few panels had me scratching my head a bit as a new mystery unfolds, but I’m definitely looking forward to finding out just how this new situation occurred.